MarketSaw - 3D Movies, Gaming and Technology: Exclusive Interview: CLOUDY WITH A CHANCE OF MEATBALL's Rob Bredow! Exclusive Interview: CLOUDY WITH A CHANCE OF MEATBALL's Rob Bredow! Jim here. Got a special treat for you stereographic 3D animation fans out there! Rob Bredow, Visual Effects Supervisor for Sony Pictures Imageworks spoke with me about the work they have done on CLOUDY WITH A CHANCE OF MEATBALLS and I tell you, the more I see and hear about this project the more stoked I get. CLOUDY rolls in for release in 3D theaters across the country on September 18. 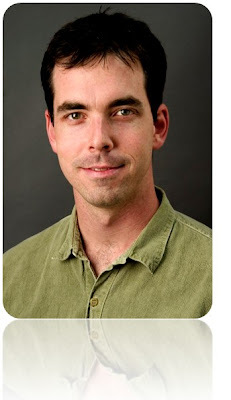 So here is Rob Bredow! Jim: How early in the process was the decision made to make this a 3d film? Rob: CLOUDY WITH A CHANCE OF MEATBALLS was a great experience for us because the studio supported it being made in 3d almost from the very beginning. This gave us the ability to be 3d aware in the early planning stages and during the layout phase of the movie. This also gave us the ability to really tune the 3d experience from beginning to end. Fortunately at Sony Pictures Imageworks we have a long history of making stereo films dating back to The Polar Express in 2005. Since then, we have approached each of our animated film as if they may be done in 3d because it’s been our experience that once filmmakers see the work coming together, there is almost always a desire to extend their films to three dimensions and make it as immersive as possible. We’re very fortunate that Sony Pictures Animation’s CLOUDY WITH A CHANCE OF MEATBALLS is our 7th stereo production here at Imageworks. Jim: From your experience, besides things like convergence and interocular, what do you find yourself focusing on in order to make a shot or sequences of shots work in 3D? Rob: We talk a lot about our “stereo budget”. We like to budget how many of those high impact moments you will have in the film. We’ve found the more selective we are with the stereo moments, the more effective those moments are for the audience. 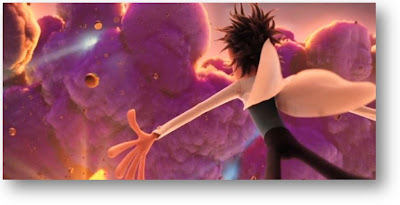 For a movie like CLOUDY WITH A CHANCE OF MEATBALLS, it’s easy to imagine some amazing stereo moments when you’ve got food falling from the sky and feeling like its landing right in the audience. 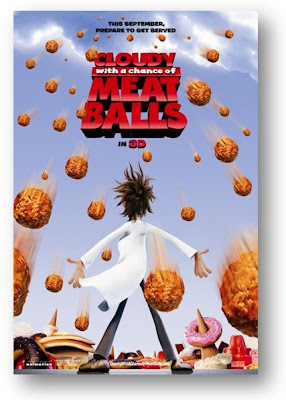 CLOUDY WITH A CHANCE OF MEATBALLS is really a perfect movie for 3d. Jim: Are they any new stereoscopic 3D techniques that you are pioneering on this film that you have not yet implemented in your previous 3D movies? Rob: Our stereo 3d technology has come pretty far. We are no longer inventing as much new technology but rather refining our techniques for the creative requirements of the film. Specifically for Cloudy we refined the way we used our 3d camera layout and did that work as early as possible. That allowed for the most creative flexibility on our side which in turn will help create a great 3d experience for the audience. Jim: What sort of computer and software do you use in your day to day tasks in creating CLOUDY? Rob: We use a wide assortment of hardware and software to make our films. We use some off-the-shelf software like Maya and Houdini as well as our own in house software for cloth, hair, lighting and many of the other areas of our pipeline. One of our biggest achievements on Cloudy is using a new renderer called Arnold which we helped to develop in order to meet the needs of this film. 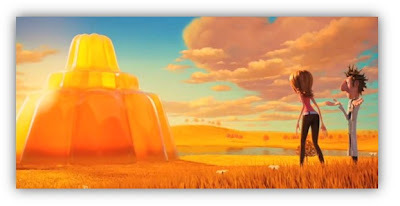 Some of the scenes like the Jello bounce house and the Gummy Bears would have been nearly impossible without this new rendering technology. Jim: If someone was starting out and wanted to be doing exactly what you are doing today, what advice would you give them? What education is required/suggested? Do you have to work at a single location all the time or can you work remotely? Rob: First, go see lots of movies. It’s a great training ground. Then, get as much experience with 3d animation, lighting and rendering as possible. The nice thing is that home computers are very fast today and there are cheap or free training versions of some of the software we use everyday. That kind of experience goes a long way towards both teaching you how stuff works, and making sure you love doing it. Most of our artists work in-house but we do have a few people who work remotely. Jim: Some artists may have differing opinions on how to present their scenes in 3D - how is this brought into the creative mix to determine a final decision for the team? Rob: For each show we have one person who makes the final stereo calls for the film—the stereo supervisor. This helps give the movie consistency and we make sure we make the strongest choices for the movie, not just each individual shot. Of course, artists often present creative ideas and as long as they contribute to the film overall, they make it into the film. Jim: Describe a typical day in your life - How much of the day is spent in creative process as opposed to actual scene creation? Rob: My job consists of supervising the teams of people working on the various aspects of the film. Most of my time is spent in the screening room reviewing work and providing direction as the teams work to complete their lighting or effects work. Most of my interaction is on the creative side, although we still spend time talking about the technical merits of one approach over another. In terms of the life of an artist, we work really hard to provide tools so that they spend their time making creative choices instead of fighting technical problems. Even so, the best artist has a good mix of technical and artistic skills because there is always troubleshooting needed to pull together shots as complicated as the ones we create. Jim: The color palette for CLOUDY is amazing - are there special techniques involved in creating this, and/or is it there a person on the team that is influencing in this direction? Rob: Michael Kurinksy is the art director on the film, so thanks to him and his team, we were provided with great inspiration for the colors and lighting found throughout the film. Each of our supervisors and lighting leads then add their own personal touch as we take those ideas from paintings to an actual 3d world. We’re also doing some things in the way we’re handling the color to make sure the version you see in every theater matches our original intent as closely as possible. Cloudy is going to look incredible on new digital projectors that many theaters are now adopting. Jim: How long does a project like CLOUDY take to complete? 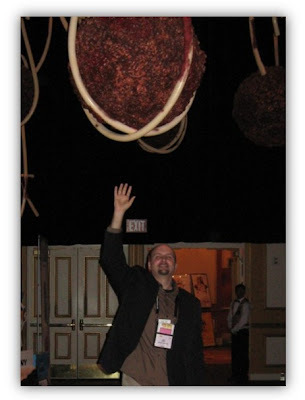 Rob: I’ve been working on the project for two and half years and that’s pretty normal for an animated project..
Jim: I enjoyed your CLOUDY display at ShoWest this year (That's me under that giant meatball)! Do you rely on actual physical science in your world (effects of gravity, etc) or do you employ a cartoonish freedom for this project? Rob: I like to say that CLOUDY WITH A CHANCE OF MEATBALLS is the first real “cartoon” I’ve ever had a chance to work on. I supervised animation before on Surf’s Up and The Polar Express, but those experiences didn’t offer the same freedom to bend the rules of physics like this film does. Jim: How do you integrate the voice cast? Is it a kind of a chicken and egg thing where you need to have the actors give an emotional performance to get their faces just right - but to enable the actor's success you need to have the scenes playing out in front of them? Rob: The actor drives the performance. We nearly always record the actors first and they are free to give the characters the voice they want and then we build the animation around their performance. Sometimes we even record video reference of the actors so we can be inspired by their facial expressions. Jim: What are you the most proud of in CLOUDY? Rob: I love the fact that we have such a wide variety of everything in CLOUDY WITH A CHANCE OF MEATBALLS. From the amazing clouds, the food falling from the sky, the wide array of characters, the huge town—basically everything about the scope of the movie is incredible. We joked around at the beginning of this production that we didn’t have any thing in Cloudy that we didn’t know how to do, but we weren’t sure how to do it all together! That’s been the trick because Cloudy packs it all into an amazing 90 minute movie. Jim: Why is there such a different feeling between animation houses? SHREK is so much more different than WALL-E, yet both are obviously very successful. Is the difference in the human resources or the technology involved? Both? Rob: I think there are both technical and artistic choices that yield such different looks between houses. One thing that we are proud of at Sony Pictures Imageworks is that we don’t have one “house look.” This year we have worked on Watchmen for Warner Brothers and that had completely photorealistic human animation, G-Force for Disney which has hi-tech photorealistic computer generated guinea pigs, and Sony Pictures Animation/ Columbia Pictures highly stylized film CLOUDY WITH A CHANCE OF MEATBALLS all at the same time. In fact, some of the same artists worked on multiple films. It’s one of the great things about working at a place that does animation and live action visual effects at the same time. Jim: Did you use a 3D virtual camera while making CLOUDY? Rob: Absolutely. Our hand-held virtual camera is a great tool in our arsenal. You’ll notice it especially during the action sequences where a hand held camera really helps compliment the action. Jim: What project is next for you? Rob: After Cloudy wraps, I’m moving into the Chief Technology Officer position for Imageworks and will be supervising the technology development for our studio. This will give me an opportunity to work very closely with the teams building the next generation of technology for our next round of films. I want to thank Rob and Sony Pictures Imageworks for their help in putting this together! I am really looking forward to seeing how 3D is used here as the movie begs for some in your face action - normally I am against that of course, but for family adventure movies like this (and horror too) and if it is used tastefully (meatballs!! ), then all is good.